Traffic and mobility is an important theme for the province of Antwerp. They set great significance on both theoretical and practical traffic-safety knowledge and skills. That is why Antwerp created a quality label for primary schools. Now the region of Flanders is implementing it on a larger scale. 3) a safe school environment. Schools that aim for these objectives can get or keep the ‘10/10’-label. Five steps can lead to receive the label. Declaration of interests. The school signs an agreement that they will become partners in the project and together with teachers, pupils and parents will strive for the quality label. Self-evaluation. The school fills in a self-evaluation form and sends it back to the 10/10 task-force. Based upon this info the task-force will get a first impression. Individual advice. 10/10-advisors visit the school with a focus on problems and possibilities. Activity calendar. The school informs the 1010 task-force in May what they have done during the school year, in order to obtain the quality label. An activity calendar with proof of the activities is made up. Evaluation. Every year the 10/10 commission reviews all participating schools and awards the school that are positively evaluated. The three objectives mentioned above are translated in some criteria marks.>These criteria marks can be used as a guide by the schools. They can be a source of inspiration for the schools to take new initiatives. Every school gets enough freedom to fulfil the criteria marks on a personal way. The label has proven to be a good instrument to stimulate schools to work around the themes pf traffic safety and mobility education, and to seek out partnerships in doing so. 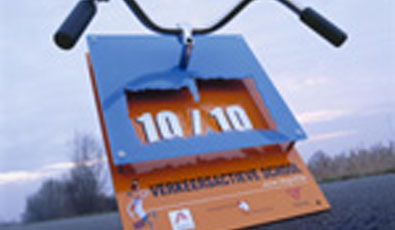 In October 2006, the province of Antwerp distributed the quality labels of 2005/2006. Antwerp was proud to give the desired label to 111 schools of the 151 candidates. These schools deserved a 10/10 for being actively involved with transport and mobility education. Since 2006, the Flemish Foundation for Trafficknowledge (FFT), an organisation under the Flemish government is spreading this label throughout Flanders as part of their educational activities in primary schools. Ten municipalities have joined the project for this first year of experimenting on a larger scale.